Taking a closer look at the strengths and weaknesses of Rockets second round pick Chinanu Onuaku out of Louisville. The NBA Draft is the annual opportunity for organizations to improve depth, find a probable starter, and gamble on potential contributions from international and collegiate prospects. Many pundits, reporters and fans did not know if the Rockets would stick with their two second-round picks at 37 and 43. 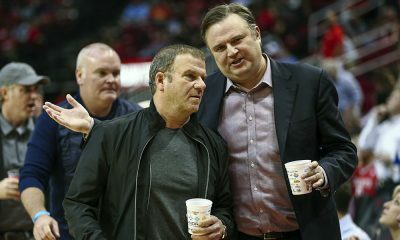 The Rockets were reportedly looking at trading into the first round of the 2016 NBA Draft, and I heard on Thursday morning that it was the goal. However, the Rockets stayed at those two second-round positions and selected 6-foot-9 Louisville PF/C Chinanu Onuaku with 37th overall pick, and 7-foot-2 Chinese C Zhou Qi with the 43rd overall selection. 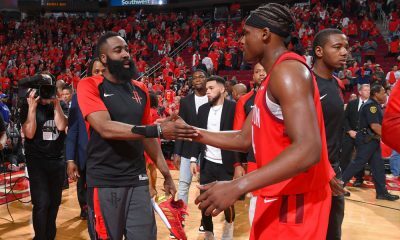 After the draft, the Rockets reportedly agreed to deals with three players at positions of need for this upcoming season. Oregon State guard Gary Payton II, Gonzaga forward Kyle Wiltjer, and Texas guard Isaiah Taylor all signed three-year deals with team options as undrafted free agents. Not all rookies will contribute right away, and many will lack the opportunity to crack the rotation. A majority of these players will likely see time with the Rio Grande Valley Vipers. With that in mind, it’s important to highlight two specific players who will have a chance to prove their worth and ability to contribute and develop a role in Coach Mike D’Antoni’s offense: Chinanu Onuaku and Gary Payton II. This will be a two-part series. I’ll first highlight how Chinanu Onuaku fits the Rockets spread pick-and-roll system and how he can continue to develop offensively and defensively. For the second piece, I’ll analyze Gary Payton II and break down his offensive and defensive strengths. First things first. Onuaku is younger than me by one month. He’s 19.5 years of age, but boasted a 13.9 Box Score Plus-Minus — which is an ELITE statistic for a college sophomore (or anyone his age). He’s an inch shorter than your prototypical NBA center at 6’9, but he makes up for this with his 7’3 wingspan. The Rockets value their draft and scouting models when evaluating collegiate and international players. Chinanu Onuaku excelled in various in-depth statistical categories, and factoring this with his age made him a very underrated prospect by different models. Onuaku was seen as a potential lottery selection by statisticians, and it’s not surprising for Morey to take this route, as he has done with Clint Capela and Montrezl Harrell in previous seasons. Despite his statistical accomplishments, Onuaku was ultimately drafted for his contributions on the basketball court. Defense is where Onuaku should make his biggest contribution to the Rockets. As a 6’9 center, he is undersized, but he does have intangibles that allow him to excel on the floor. During his two years at Louisville, Onuaku had a 2.2% steal rate. His wingspan and length created mistakes for ball-handlers, deflected passes and ignited fast break opportunities. Onuaku blocked two shots per game in about 25 minutes/game (3.4 blocks per 40 minutes), ranking third in the ACC. He also had a defensive rating of 84.9, second-best in the entire NCAA. Even better? When Onuaku was on the floor, Louisville only allowed 82.7 points per 100 possessions. His interior defense can be categorized as “pretty good” to “really good”, with a chance at becoming elite in the NBA. He doesn’t have the best vertical, but his feel for the game allows him to position himself around the paint to contest and alter shots. With Louisville, he had the flexibility and freedom to roam the paint area and help on backdoor screens and other off-ball screens. He’s also smart and quick enough to rotate over and patrol the lane. Anticipation is a skill that many interior-based Bigs lack, but Onuaku possesses that and more. Combine this with his wide frame and size, and the Rockets have a defensive player who can impact the opposing team’s shot selection immediately. In the modern NBA, it’s important for defenses to have personnel who are athletic, versatile, and smart defenders. This allows defensive schemes to increase complexity, switching everything and forcing miscommunication and mistakes (in this case, creating more transition opportunities for the young, athletic Rockets). Pick-and-roll defense is a requirement for any NBA big who hopes to see consistent playing time. With Louisville, Onuaku had many situations where he was forced to roam around the perimeter or contain the ball-handler off pick-and-rolls. He has quick feet that produce lateral movement, using his knees and footwork to stay in front of speedy ball-handlers. If beat by the first step of the ball-handler, Onuaku has long arms to recover and mitigate high-percentage shot attempts or eradicate passes inside the paint. He’s also a diligent communicator, constantly pointing out screens or player movement while making sure his teammates are in their proper assignments. Where he struggles in pick-and-roll defense is consistency. 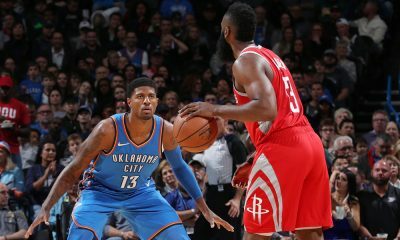 The Rockets will not want him to switch onto a smaller guard on every possession because he’s prone to immaturity in stance and hand placement. He has problems with reaching, generating poor foul calls (foul rate of almost 5 times per 40 minutes). Assistant coaches Jeff Bzdelik and Roy Rogers will work closely with Onuaku in this area. They’ve had extensive experience in developing NBA bigs, teaching them to use frame and size to manipulate angles and gain advantages against smaller players. At 6’10 (with shoes) and 245 pounds, Onuaku has a perfect frame and core for the new and revamped Rockets offense. His strength can open up spacious driving lanes for ball-handlers and shooters. Screens in D’Antoni’s offense require the screener to set a pick at a 45-degree angle on the bottom side of the on-ball defender. Essentially, the screener picks the waist of the on-ball defender, forcing them to go over the top of the screen. With this 45-degree angle, the contact gives the ball handler enough space to maneuver inside. Onuaku isn’t polished offensively, but he possesses attributes and a terrific body to provide contributions in the heavy spread screen-and-roll and pick-and-roll offense. Most of Onuaku’s points will come off of offensive rebounding and rim running. He had 4.9 offensive rebounds every 40 minutes, one of the best rates in all of college basketball. As mentioned before, Onuaku has great anticipation and feel. He can locate the ball, move quickly towards the area, and box-out any defender (great contested rebounding percentage). He grabbed 13.8% of Louisville’s available misses by using his high motor and relentless energy. Lobs, dump-offs, and layups consisted of 53% of his field goal makes. Louisville’s offense was very guard-oriented, explaining why he did not have many attempts during the season. When he was involved in the offensive movement or set, he was in the 27th percentile for pick-and-roll scoring. He has great hands and cutting ability, utilizing the duck-in to get easy looks at the rim. However, he doesn’t have the most explosive vertical or speed to escape from defenders, and thus can have trouble finishing over opposing players who are bigger and longer. The good news for Onuaku is that D’Antoni is terrific at cultivating and molding young bigs into competent pick-and-roll players. Chinanu Onuaku’s biggest strength on offense may be his ability to pass the basketball. He does boast a high turnover rate of about 23%. However, he has a very high basketball IQ for someone of his age and experience level. His passes aren’t overzealous – instead, they’re soft and accurate while often putting the ball in position for the player to catch and move. For those questioning the turnover rate, consider Louisville’s offense and the movement involved. With more polish and systematic consistency, that number should decrease dramatically over the course of his career. With the new Rockets offense, ball movement and player movement will be emphasized. Onuaku’s strength as a passer is hitting the cutter as they dive inside and finding the open shooter in the corner or along the wing. It may seem easy, but rarely do players of his size and length possess such mastery of passing at such an early age. With him on the roster, and if Motiejunas returns, the Rockets may be changing the style of player they want at that position. Bigs on D’Antoni’s roster must possess the ability to pass the basketball and help facilitate movement and scoring on offense, something Onuaku clearly has and will improve upon. 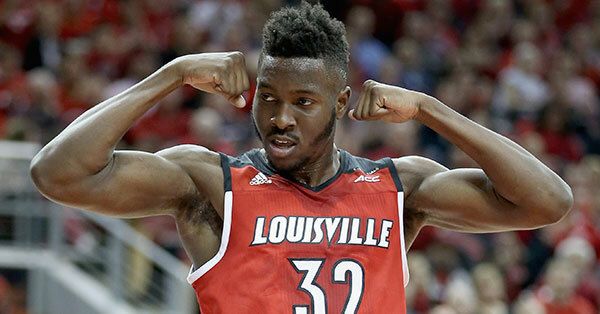 Chinanu Onuaku isn’t the most explosive or flexible athlete. His standing reach is incredible, but his lack of a significant vertical limits him offensively as a pick-and-roll threat. He’s not a professional scorer. However, that’s not what the Rockets were looking for when they drafted him. They marveled at his interior defense, ability to switch onto perimeter guards and eradicate possibility of penetration, passing to cutters and open shooters, and his high IQ on offense. Onuaku should get playing time on the second unit as someone who can anchor the defense and grab rebounds at a high rate over opposing front-line players. Will he be a star? No. 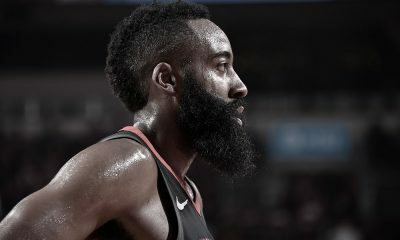 But he’s someone who can star in his role, develop into a consistent and dominant back-up PF/C, and provide the Rockets with consistency at a position which has had a revolving door in effort and play the last few seasons.